With Easter right around the corner, it’s always fun to find new and different ways to engage young children over the holiday. Whether it’s through dramatic play, reading or story-telling, or even holiday-themed puzzles or mind games, there are lots of ways to stoke your child’s enthusiasm for the holiday while engaging in play that’s helpful to overall development. Creative play is particularly important: little fingers develop fine motor skills with paint and brush in hand, and little brains start exploring self-actualization and creative expression through artistic pursuits. Try enjoying one of these exciting, creative activities this holiday season to help your child truly embrace the holiday, learn a little something, and have a ball! The plastic Easter eggs that the Easter Bunny uses for hiding treats and treasures can serve other functions too. Have you thought about using plastic Easter eggs as painting utensils? 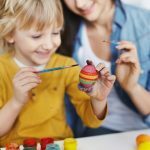 Kids (especially younger children in preschool or kindergarten) can have great fun painting with plastic Easter eggs. All you need is some white art paper, a few paper plates (for palettes), some Tempera acrylic paint, and leftover plastic Easter eggs. 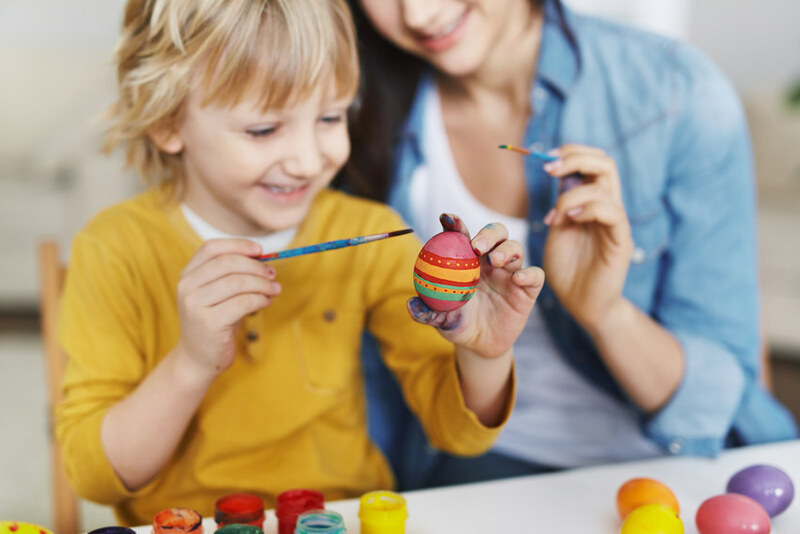 Let your kids have fun “stamping” multi-colored circles with an opened Easter egg. Or they can have fun rolling whole eggs across a painted piece of paper, watching their strokes unfold. They’ll work on their fine motor skills and also learn about shapes, watching the interaction of the rounded egg with paint and paper. “Stamping” paint with a wide array of objects is a great way for kids to learn to appreciate shape and texture. This April, you can help them create their very own Easter egg stamps out of potatoes! Simply cut a few raw red potatoes in half (red potatoes, when cut in half, will take on a pretty good “egg” shape), pour some Tempura acrylic paint onto a paper plate for them, and let them get to stamping! You can show them how to create fun stripes or zig-zags on their stamp by scratching the patterns directly onto the potato. 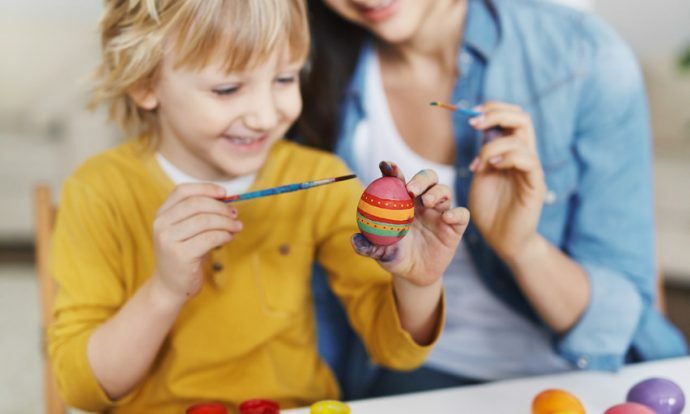 They’ll make beautiful Easter egg art and you’ll be amazed at what your kids can learn about manipulating shape and texture with this simple, easy craft. 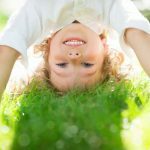 Are your kids game-players? Engage them with a rousing game of dominoes with pieces that they’ve crafted themselves! Easter Egg dominoes are fun and easy to make. All you’ll need is some craft paper, markers, and stickers. Help your kids cut craft paper into egg shapes: these will serve as your tiles. Use the markers to color a thick line through the middle of your eggs, separating them into the two sides of the domino tiles. Then use stickers to create the “dots” on each side of the tile. Vary the numbers that are used on each side. And then have fun! Kids who are learning about numbers will love playing dominoes with you this spring, and having made the tiles themselves makes the activity even more rewarding. Here’s a clever way to put a creative spin on the classic Easter egg hunt. Help your kids design their very own Easter egg treasure map! Before the egg hunt, sit down with kids and, using pen and paper, have them map out the space in which they’ll hunt. It’s a fun activity that exercises kids’ spatial awareness in a big way. Then give them some stickers or a magic marker. Let them begin their Easter Egg hunt with their map in hand: as they find the location of their eggs, have them mark the spot on their maps with either the stickers or markers. At the end of the hunt, they’ll have a complete treasure map denoting all the locations of their holiday treasures! Time to sit down with kids for a beloved holiday-inspired book? Why not create your own finger puppets to add to the story? It’s easy to make fun and friendly bunny-rabbit finger puppets: all you need is some craft foam, googly eyes, glue, and a pair of scissors. First, you’ll help kids cut out a simple rabbit shape from their craft foam (just around, squat circle with two “ears” projecting from the top). Towards the bottom of their circle, have them cut two small holes: this is where their fingers will go. Adhere googly eyes towards the top of the circle and give your bunny a cut-out foam nose. Kids can decorate their bunnies further with markers or glitter or leave as is. Either way, these cute, easy finger puppets make a charming addition to bunny-based story times. 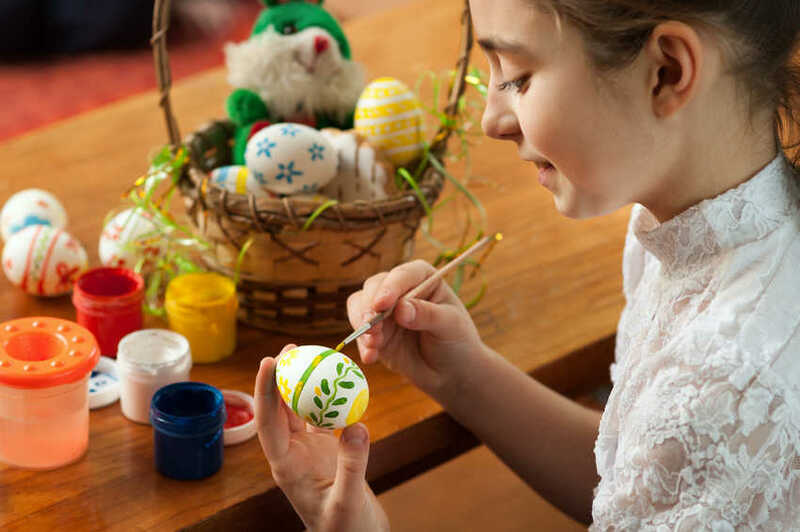 Helping kids flex their creative muscles is so important, and by incorporating the holiday into their crafts, kids can learn more about Easter while their inner-artists develop (and most importantly, they’ll have FUN). At Right Steps Education, we understand the value of arts and crafts time and we ensure that our kids get as much creative time as possible. Come talk to the talented, dedicate teachers at Right Steps Education to find out what other artistic activities we’ve got brewing for kids this season!